Group HES are the experts in the hydraulic industry and are an ever-expanding company that is committed to its suppliers, its customers and its people. Our management team is personally committed to seeing his staff succeed. Proof of this commitment can be seen in the many years of service from the staff, several have been with the company for over 20 years and many with over 10 years service. Working at Group HES is challenging as the environment is technically advanced and innovative so you must be prepared to work well within a team but be self-motivated and able to work independently. Driven, engaged and hardworking employees are rewarded with a competitive negotiable wage, pension scheme and a stimulating workplace, where input is valued and heard and your development is nurtured and sustained. Please call the Recruitment Team on 01452 730 774 (Option 4) if you would like to discuss any role further. We have a dedicated recruitment team that enjoys the personal side of recruitment so we ask that recruitment agencies please refrain from contacting us. 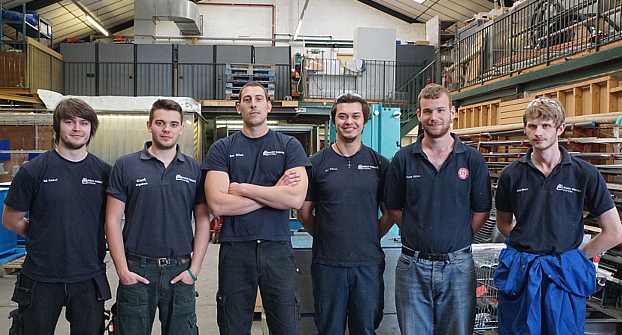 As a company, Group HES has had various apprentices over the years. However, in 2010, Group HES officially launched their apprenticeship scheme, with a commitment of employing at least 2 apprentices per year. The scheme complements the company’s commitment to developing highly skilled and loyal employees, by supporting their learning and nurturing their talent. Supporting apprentices is a vital element of the development of the company and the future of British manufacturing. By joining the scheme, you will find the platform to become an engineer within a challenging yet fun environment; working with motivated colleagues and the chance to be recognised as more than just a number. Click here for the flyer for our Apprentice Open Evenings that took place on March 29th 2017!